The BISA research workshop ‘Security theory, expertise and practice: past experiences and new approaches to collaboration’ was held at BISA in Bath on 12th June 2018, and was sponsored by the West African Peace and Security Network. The workshop was co-organised by Philipp Lottholz and Elisa Lopez Lucia (member of the WAPSN steering committee). It brought together researchers and policy-practitioners to discuss the conditions of collaboration, and the connections between scholarly knowledge production on the one hand, and security expertise, policy-making and practices on the other hand. Workshop discussions focused in particular on two geographic areas: West African and Central Asia. The key conclusions of the workshop are summarised in a blog post available here: https://securitypraxis.eu/cooperative-research/; and the full report can be found here. Place: Portland Building (1.67), University of Portsmouth. Peace Support Operations in West Africa, Opérations de Maintien de la Paix en Afrique de l’Ouest. The case of the UN and French intervention in Mali has certainly highlighted the difficulties arising from such blurred lines, as the 2015 Report of the High-Level Independent Panel on United Nations Peace Operations argued. Most notably, the distinction between UN-led peacekeeping and French-led counterterrorism operations is arduous and compounded by the difficulties in distinguishing the ‘terrorists’ from the legitimate political actors. Moreover, the peace support operations in Mali are intertwined with the regional counterterrorism efforts of the G5 Sahel. The latter is not only supported by the French government and military, but its members are troop contributing countries to MINUSMA: Burkina Faso contributes 892 personnel, Chad 1,092, Mauritania 6, and Niger 868 (as of 31 January 2015; Mali being the fifth member of the G5 Sahel). Le terme « opération de paix » (OP) est largement utilisé par les acteurs civils pour décrire leurs activités en situation de conflit ou post-conflit, notamment dans le contexte de projets de réconciliation et d’efforts à l’aide humanitaire. Les organisations militaires utilisent aussi le terme pour décrire une variété d’activités militaires qui se distinguent des opérations militaires dites « normales » ou « traditionnelles ». La doctrine OP de l’OTAN, par exemple, qui a été distribuée aux armées africaines au début des années 2000, définit les OP comme des opérations impartiales, normalement en appui à une organisation reconnue internationalement comme les Nations unies. Les opérations multifonctionnelles sont conçues afin de créer un environnement sécuritaire et afin de faciliter les efforts des éléments civils de la mission. Le concept OP peut être déployé pour inclure le maintien de la paix, l’imposition de la paix aussi bien que la prévention de conflits, le rétablissement de la paix, la réconciliation et les opérations humanitaires. Hors des cercles militaires, le terme « opération de paix » est souvent utilisé pour inclure tous les types d’OP. Selon plusieurs chercheurs, praticiens et documents de doctrine militaire, les OP se distinguent de par leur neutralité. Les OP ne doivent ni appuyer, ni s’opposer, à un groupe particulier, mais être conduites de manière neutre et impartiale. L’accent est mis sur le mandat, qui ne doit pas désigner un ennemi ou rechercher la victoire militaire. Pourtant, la neutralité et parfois l’efficacité ou l’utilité des OP sont remis en question dans le contexte d’opérations où les frontières sont incertaines entre le maintien de la paix, les opérations de guerre, les opérations de contre-terrorisme et de contre-insurrection, la construction de l’État et les actions humanitaires. Le mélange des objectifs civils, humanitaires, militaires et autres dans le même mandat peut occasionner (et a déjà causé) des incohérences politiques, des mouvements ou actions de résistance locale et des obstacles à la recherche de solutions politiques au conflit. Le cas de l’intervention de l’ONU et de la France au Mali a certainement mis en relief les difficultés résultantes de ces lignes floues, comme le rapport 2015 du Groupe d’étude sur les opérations de maintien de la paix de l’ONU a remarqué. En premier lieu, la distinction entre le maintien de la paix mené par l’ONU et le contre-terrorisme mené par la France est, en pratique, difficile sinon impossible à mettre en œuvre et illustre bien les difficultés et conséquences de distinguer les ‘terroristes’ des acteurs politiques légitimes. De plus, les opérations de paix au Mali sont entrelacées avec les efforts de contre-terrorisme régionaux du G5 Sahel. Ce dernier n’est pas seulement soutenu par le gouvernement et l’appareil militaire français. Ses membres constituent une partie non négligeable des troupes de la MINUSMA : le Burkina Faso contribue 892 personnels, le Chad 1 092, la Mauritanie 6 et le Niger 868 (en date du 31 janvier 2015, le cinquième membre du G5 Sahel est le Mali). Le cas du Mali est un exemple parmi d’autres. Les conflits des années 1990 au Sierra Leone et au Libéria ont également illustré comment les dynamiques régionales (i.e. interventions régionales, économie politique de guerre menée par les seigneurs de guerre, etc.) exposent les limites du cadre national (étato-centrique) des opérations de paix (onusiennes notamment). De tels exemples démontrent bien les nombreux défis politiques, stratégiques et pratiques auxquels font face les acteurs civils et militaires impliqués dans les opérations de paix, soulevant également un nombre significatif de problèmes théoriques, conceptuels et normatifs. WAPSN/FrancoPaix Conference May 4th and 5th 2017, Montréal. The WAPSN symposium 2017 focused principally on the theme of: ‘Back to the Future? Conflict Resolution and Sustainable Peace in Contemporary West Africa.’ A plethora of literature exists on the violent conflicts in West Africa and how they are managed most especially through peacekeeping missions. On the other hand, scant attention is given to the study of how the root causes of the extremist violence in the region are addressed or can be removed through conflict resolution mechanisms. The 2017 WAPSN Symposium sought to address this existing lacuna through our knowledge system in a manner that makes a contribution to the attainment of the global Sustainable Development Goals (SDGs) in West Africa. The goal of conflict management is to control the spiral of a conflict in a manner that reduces its damaging effects. In this case, the conflict is assumed to be a terminal problem that is easier to manage than solve. Taking this into consideration, peacekeepers (whether along the Chapters 6, 7 or 8 trajectories) focus more of their energies on calming the conflict situations and limiting casualties, with the result that exit strategies for peacekeeping missions are often based on noticeable reduction in violence. It is one thing for the violence associated with a conflict to be terminated and it is another for the root causes of the conflict to be removed. The end of physical hostility between belligerents does not also suggest that the psychological damage done to the fabric of the society by the violent encounters has been resolved. Hence, in many post conflict societies in West Africa today, people still refer to the past. The Nigerian civil war was fought from 1967 to 1970. Some Igbo people are still nursing the “Biafran” agenda of exiting from Nigeria. Many lives have been lost in 2016 for this. The militant youth in the oil-rich Niger Delta region of Nigeria are back to the creeks blowing up oil pipelines. A lot is spent on defeating Boko Haram in Nigeria but there is little commitment to addressing the core issues that brought the insurgents into being. It may be recalled that there were many phases in the Liberian crisis. One phase ends and another starts later. This is largely because the core issues in the conflict were not addressed. The country has consistently found it difficult to experience any political stability. The violence in Mali might have abated but the conflict issues are yet to be resolved. 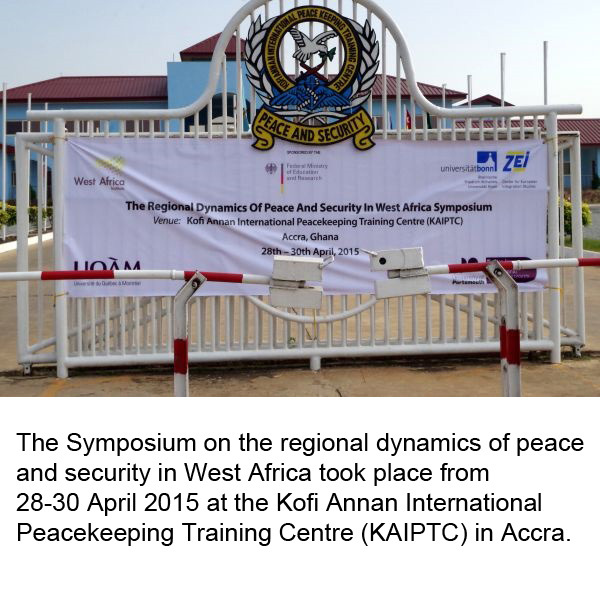 I n April 2015, the WAPSN organized a symposium on the Regional Dynamics of Peace and Security in West Africa at the Kofi Annan International Peacekeeping Centre in Accra. The event brought together researchers and practitioners from Africa, Europe and North America to discuss current challenges to peace and security in West Africa. Among others, the Vice President of the ECOWAS Commission, H.E. Dr. Toga Gayewea McIntosh, the Political Director of the ECOWAS Commission and UN representatives were in attendance. Debate focused on the crisis in Mali, the MINUSMA operation, maritime security in the Gulf of Guinea, the role of France in West Africa and on the coordination of different organizations in conflict resolution. “The prevention of conflicts requires their deeper understanding. Therefore, a better communication and cooperation between practitioners from regional and international institutions, civil servants from national governments and researchers is needed to strengthen this understanding and use it in an effective way”. 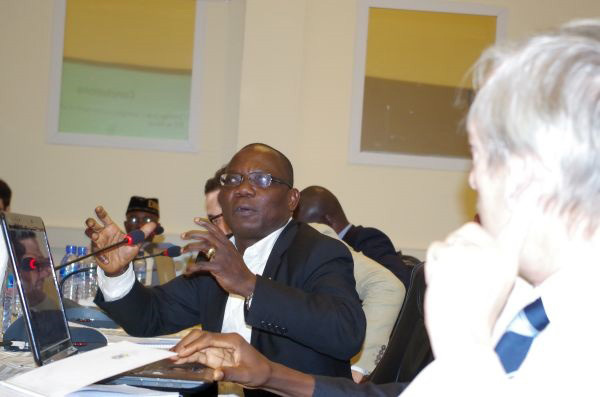 The Political Director of the UN-Office at the African Union, Dr. Abdel-Fatau Musah, taking part in discussion with academics from the West Africa Peace and Security Network.